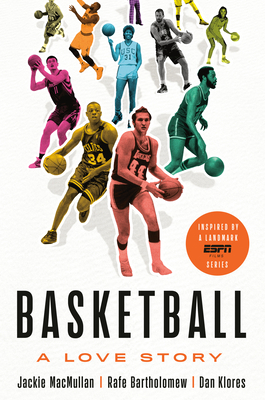 Inspired by a major ESPN film series, this is an extraordinary oral history of basketball—its eye-opening untold history, its profound deeper meaning, its transformative influence on the world—as told through an unprecedented series of candid conversations with the game’s ultimate icons. This is the greatest love story never told. It has passion and heartbreak, triumph and betrayal. It is deeply intimate yet crosses oceans, upends lives and changes nations. This is the true story of basketball. It is the story of a Canadian invention that took over America, and the world. Of a supposed “white man’s sport” that became a way for people of color, women, and immigrants to claim a new place in society. Of a game that demands everything of those who love it, yet gives so much back in return. To tell this story, acclaimed journalists Jackie MacMullan, Rafe Bartholomew and Dan Klores embarked on a groundbreaking mission to interview a staggering lineup of basketball trailblazers. For the first time hundreds of legends, from Kobe, Lebron and Steph Curry to Magic Johnson, Dr. J and Jerry West, spoke movingly about their greatest passion. Iconic coaches like Phil Jackson and Coach K opened up like never before. Those who shattered glass ceilings, from Bill Russell and Yao Ming to Cheryl Miller and Lisa Leslie, explained what it really took to lay claim to their place in the game. At once a definitive oral history and something far more revelatory and life affirming, Basketball: A Love Story is the defining untold oral history of how basketball came to be, and what it means to those who love it. JACKIE MACMULLAN is a television analyst for ESPN and a senior writer for ESPN.com. She has been covering basketball for more than three decades, beginning at the Boston Globe, where she was the first female sports columnist in the paper's history. She covered the National Basketball Association from 1995 to 2000 for Sports Illustrated and has authored four books, including New York Times bestsellers When the Game Was Ours and Shaq Uncut. In 2010, MacMullan became the first woman to win the Curt Gowdy Award by the Basketball Hall of Fame for outstanding contributions to basketball. RAFE BARTHOLOMEW is the author of Pacific Rims. His writing has appeared in Grantland, Slate, the New York Times, Chicago Reader, Deadspin, and other leading online and print publications. His stories have twice been honored in the Best American Sports Writing series. DAN KLORES has been awarded the Independent Spirit Award for best director of the year for his classic documentary 'Crazy Love,' and the Peabody for 'Black Magic.' Four of his films premiered at the Sundance Film Festival, and he has written for The New York Times, New York Magazine, Daily News, Esquire, and other publications. He is the author of Roundball Culture, and three off-Broadway plays. “This is a shadow history of how basketball became the game that it is today—it’s all the details you don’t know about all the stuff you always thought you understood. Maybe you think you know everything about Wilt’s 100-point game. You don’t. Maybe you think you have a grasp on the ABA and the ACC and the complexity of institutional racism and Michael Jordan’s secret grudge with George Gervin. You do not. This is not a book for people who just think basketball is OK. This is a book for people who care.” —Chuck Klosterman, New York Times bestselling author of I Wear the Black Hat and But What If We’re Wrong?